The 1855 map of Rockland is a snapshot in time, framed by the 1850 and 1860 Census. The map presents a mystery, as it shows the westernmost house on Mechanic Street with a black square marked A. Elwell. On the 1873 map it is gone. Did they just forget to mark it? Did it burn down? Is it the present house at 10 Mechanic? We let Mr. Elwell have a house lot. Andrew Elwell of St. George and Hannah T. Maker of Thomaston (Owl’s Head) were married Aug. 16, 1838 in Rockland. They were both about 20 years old. 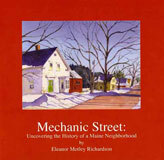 By 1854, they had five children and were ready to build a house, which they did in 1854 at the present 10 Mechanic St. Unfortunately, Andrew, a mariner, was lost at sea sometime between 1855 and 1860. I can’t find any deed at the courthouse from Henry Ingraham to Andrew Elwell, although Elwell was taxed for the land and house in 1855. Since it was not uncommon for people to build before legally buying the land, I suspect Andrew and Hannah Elwell never scraped together the money to buy it. The census for 1860 tells us that Hannah Elwell, 40, was by then a widow with 5 children: Oris, 21; Charles, 19; Joshua, 15; Clara, 10; and William, 7. No wonder she sold the porch off her house! The census shows her with $600 in personal property, but no real estate, which implies that in 1860 she owned the house, but not the land. She married Charles Ordway in 1863 and moved out in September of that year. She cashed in her assets, sold the house, and it was moved off the property in 1864. The property has a long history of female ownership. In 1888, Henry’s son Edwin, sold to Mary Burleigh the lot abutting the back of her property at 57 Main Street, which is our parcel in question at 10 Mechanic. So it appears the Ingrahams still owned the land 24 years after the Elwell house was sold and moved. When Mary Burleigh sold her Main Street house to Mary Gould, the lot at No. 10 went with it. The lot and house have a history of fairly long ownerships. The present owners, John and Sherrie Schmitt, have been there 14 years. Alan Thomas, whose family lived there from 1972-1992, came to our house trick-or-treating this year, and remembered Ted Rollins making stilts for him and for Stephanie McLain in our barn. He also startled me by saying Rollins told him the house at No. 10 had been moved up from the Shipyard and that it was previously a storage shed up on stilts. He recalls that his parents, Howard and Beverly Thomas, did a major renovation and he helped his dad build a “bar” for informal dining in the kitchen, which remains today. The Thomas family had three children, Beverly, who had already left home, and Alan and Karen who were in their early teens. 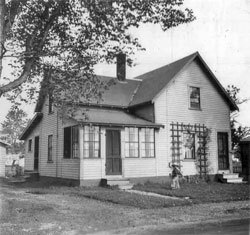 They had bought or been given the house by Beverly Thomas’ mother, Minnie Treat. 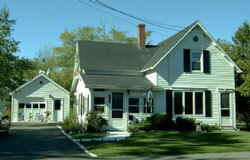 John and Cheryl Schmitt bought the house in 1993. A veteran of the Coast Guard, John Schmitt served in Iraq in 2004-2005. Cheri Schmitt was living alone at No. 10, and we all looked forward to his safe return. So we especially enjoy seeing him walking up and down the street enjoying an outdoor cigar, and sailing his Sunfish out to the Breakwater and back. For 15 years he worked the second shift in Security at MBNA in Belfast. Now that MBNA has pulled out, John has joined the staff at the Maine State Ferry Service, and enjoys being close to the water. Cheri works at the Owl’s Head Transportation Museum, in charge of membership. They have one grown daughter, Gretchen. When the Schmitts moved to the house, they were amazed to find 18 outlets in the sun porch. It turns out that a former owner was a hairdresser, running the business out of his home. Alan Thomas recalls that the hairdresser was Grover Lunt.